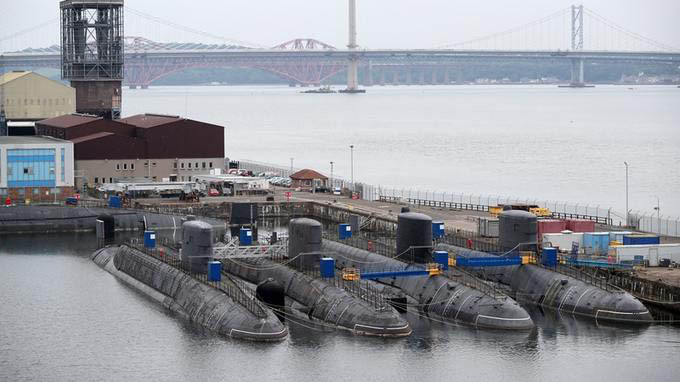 MoD criticised over failure to dispose of retired nuclear submarines https://www.itv.com/news/2019-04-03/mod-criticised-over-failure-to-dispose-of-retired-nuclear-submarines/ The Ministry of Defence has been condemned for a “dismal” failure to dispose of decommissioned nuclear-powered submarines. The MoD has submarines which have been in storage longer than they have been in service and the UK now has twice as many submarines in storage as it does in service. The National Audit Office (NAO) said the department has not disposed of any of the 20 boats no longer in service since 1980. Some of these vessels still contain nuclear fuel and the failure to address the issue risks damaging the UK’s international reputation as a “responsible nuclear power”. The issue was raised during Prime Minister’s Questions by Labour MP Luke Pollard who asked whether the prime minister will extend the nuclear clean up to include all the royal navy submarines. Decommissioned vessels are being stored at Devonport and Rosyth, while arrangements are made to safely dispose of them and the radioactive waste they contain. No submarines have been defuelled since 2004, when regulators said facilities did not meet required standards. The process is not due to start again until 2023 and has been delayed for 11 years, with a £100 million cost increase to £275 million, a £12 million annual bill for maintaining and storing the nine fuelled submarines and pressure on dock space at Devonport. The Government said the ministry “needs to get a grip urgently” on the matter. Meg Hillier, chairwoman of the Commons Public Accounts Committee, said: “For more than 20 years the Ministry of Defence has been promising to dismantle its out-of-service nuclear submarines and told my committee last year that it would now address this dismal lack of progress. “It has still not disposed of any of the 20 submarines decommissioned since 1980 and does not yet know fully how to do it. “The disposal programmes have been beset by lengthy delays and spiralling costs, with taxpayers footing the bill. The vessels being stored include the first submarines used to carry the UK’s nuclear deterrent – the Polaris boats HMS Revenge, HMS Renown, HMS Repulse and HMS Resolution. A Ministry of Defence spokesman said: ““The disposal of nuclear submarines is a complex and challenging undertaking.